Arrive in Mumbai, capital city of Mahrashtra. Meet our representative and transfer from airport / railway station to your prebooked hotel (check in/out 12.00 hrs). After breakfast you embark on your sightseeing trip of the city which includes all the popular monuments / tourist palace here. Breakfast at hotel. Free till departure. Transfer to airport / railway station to depart for your onward destination / home. The booming capital city of Mahrashtra, Bombay has a beautiful range of attractions for its visitors. From nature lovers to science freks to the common tourists the city of dreams Mumbai has something special to offer to everyone. The Gateway of India happens to be the principle landmark of Bombay. The same was built in yellow basalt to commemorate the royal visit of George V and queen Mary in 1911. The construction was completed in 1924. The Gateway of India is analogous to Bombay as the Statue of Liberty is to New York. Your trip to Bombay sans visit to the Gateway of the India will be incomplete. Besides the Gateway Of India, the Prince of Wales Museum was also built to venerate King George’s visit. The construction of the museum is based on the Indo -Saracenic style of architecture and was successfully completed in 1923. The Prince of Wales Museum boasts of exhibits in various areas like the art and paintings, archeology and natural history. For all the art lovers amongst you the Jehangir Art Gallery will prove to be a heaven on Earth. The gallery is located in the compound of the Prince of Wales Museum and comprises of an Auditorium and an exhibition hall. The gallery displays the works of modern Indian artists. Besides being the venue for art exhibitions in Bombay the Jehangir Art Gallery organizes other art activities for the promotion of a national movement in contemporary visual arts. 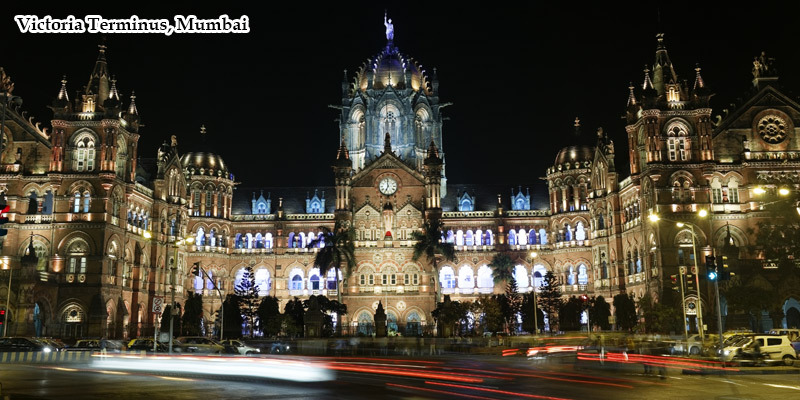 The other landmark of Mumbai happens to be the Victoria Terminus or the VT. The Victoria Terminus that was designed by F.W. Stevens follows the Italian Gothic style of architecture. It is significant owing to the fact that the historic steam train from Mumbai to Thane was flagged from here way back in 1853. In the heart of the commercial fort area stands the Flora Fountain. You will be able to access the fountain intersection from any of the five points. The Flora fountain was constructed in the memory of the Governor, Henry bartle Edward Frere. The Mani Bhawan where Mahatma Gandhi stayed from 1917-34 is also worth visiting. While in Mumbai you must pay homage at the oldest temple at Mumbai the Mahalaxmi Temple near the Malabar Hills. The Mahalaxmi temple is dedicated to the dedicated to the Hindu Goddess of Wealth. The visit Haji Ali Tomb and mosque and the Cathedral of St. Thomas are also must. The latter happens to be close to the Flora Fountain. The children as well as the adults enjoy themselves at the Nehru Planetarium and the Nehru Science Center situated in Worli. The Audiovisual shows are beneficial for even those without a scientific bend of mind. While your visit to the former be ready for the virtual space voyage. The latter too can be enjoyed with the color shadow as your dance partner. While on science the Taraporevala Aquarium cannot be missed. The aquarium is home to several exotic species sea and river fish. Besides fish the collection of the preserved species of rare animals will charm you. The shell-crafted articles have also been exhibited. Though it is the scenes with the orange butterfly fish, the blue ring angelfish, and sea horses. That will flash through when you recall your visit to the Taraporevala aquarium. For feasting your eyes on the larger species of animal kind you may drop at the Sanjay Gandhi National Park. The only wildlife preserve of Mumbai is home to panther, antelope, moose, deer and the wild beer. You may board the special park vehicles to a get closer view of the lions at the Lion Safari Park. Though the zoo of the Mumbai city is at the Jijamata Udyan Garden that boasts of animals, birds and nursery of rare plants. The Hanging Gardens beautiful landscaped garden built on a series of reservoirs is another popular hangout. Mumbai has several amusement parks like the Fantasy Land and the Essel World. The rides and the food add to the fun and frolic at Mumbai. These parks are ideal for freaking out with family as well as friends. The entry ticket is charged per head and is worth it. The water rides and the other swings are awesome. Come on get going to the city with the wide variety of source of fun, frolic and food-Mumbai.